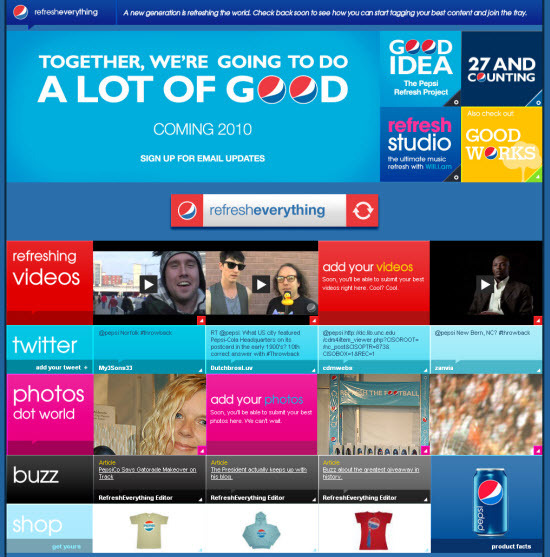 I read over at GigaOM about the Pepsi Refresh Project which plans to award millions of dollars to individuals and organizations that turn good ideas into projects that make a difference. Pepsi is seeking ideas that make us think, inspire us and ignite participation; ideas that make good things better or improve situations; ideas that refresh. The process is simple. Individuals pitch a plan. The public votes. The top projects win. And this process repeats itself every month for 10 months…The Pepsi Refresh Project will award $5,000, $25,000, $50,000 and $250,000 to individuals and organizations that turn good ideas into projects that make a difference. Upon visiting the site I couldn’t help but notice the Lifestream design in action on the site. I also find this competition interesting as it is another major corporation realizing the value in funding incentivized prize competitions which is what we do at the X PRIZE Foundation (my day job). It should be fun to watch this when the 10 month competition gets started in January.